Lenny Kravitz and Shy'm attended the NRJ Music Awards at Palais des Festivals on 13th December 2014 in Cannes, France. 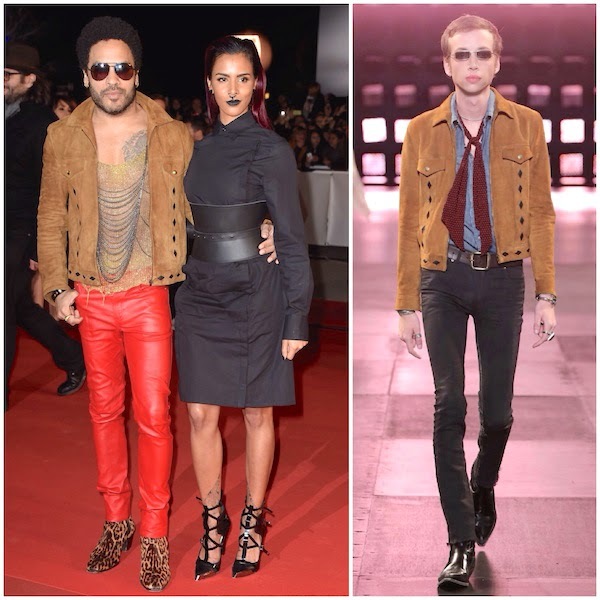 Lenny Kravitz wore a brown suede leather jacket from Saint Laurent by Hedi Slimane Spring Summer 2015. And I thought the guy would wear the button up black shirt and the girl would wear the mesh and chain detail top. How conservative am I! Admittedly I will not step out of the house in Lenny Kravitz's outfit, that is very much his signature style. I am not exactly keen on the chunky leopard print boots, but other than that I would very much bow to him. Very fascinated by his chunky rings too, love it.